More than a dozen buildings charred, set ablaze in a wave of fury. 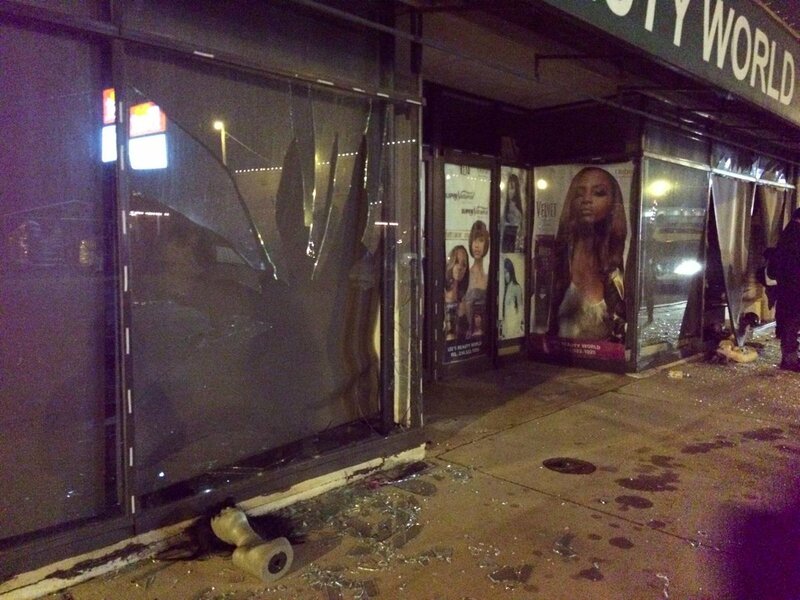 Stores -- many owned by locals -- looted, with shattered glass covering the asphalt outside. Shell casings on the ground, having been fired by unknown shooters. This is what Tuesday looked like in Ferguson, hours after an eruption of rage over a grand jury's decision not to indict police Officer Darren Wilson in the shooting death of 18-year-old Michael Brown. Many of those who took to the streets late Monday into Tuesday to vent what they say is police violence and racial injustice -- rooted in the fact that Brown was black and Wilson is white -- did so peacefully. Others did not, hurling bottles, batteries and rocks at police. An entire row of businesses on West Florissant Avenue, a major thoroughfare, was engulfed in flames. Police cars and a row of vehicles at a nearby dealership were turned into fireballs. There were so many infernos that firefighters couldn't get to every one. There were also reports of gunshots: St. Louis County Police Chief Jon Belmar heard at least 100 through the night, though Missouri State Highway Patrol Capt. Ron Johnson insisted no bullets were fired by police. CNN's Sara Sidner was struck in the head with a bottle. "What we saw tonight was much worse than what we saw any night in August," the St. Louis County police said on Facebook, referring to the days immediately after Brown's death. "Bricks were thrown at police officers, two St. Louis County police cars were set on fire and police seized an automatic weapon." Authorities responded with round after round of tear gas, as well as shooting bean bags into the crowds. Six people were treated and released with minor injuries between 10 p.m. Monday and 4 a.m. Tuesday at Christian Hospital in St. Louis, hospital spokesman Bret Berigan said. There were no known serious injuries -- either to citizens or police officers -- according to Belmar. Police in Ferguson ended up making at least 61 arrests on charges ranging from unlawful assembly to burglary to unlawful possession of a firearm to arson. By mid-Tuesday morning, the plazas were empty. Even the scene outside the police department -- where Missouri National Guard members were to provide security, under orders of Gov. Jay Nixon -- was calm. But no one was under the belief that the tensions, or the threats of more unrest, were gone. "People here have a real grudge against the police," said one protester, Demetric Whitlock. "It's not going away." It wasn't just that way in Ferguson. Twelve miles south in St. Louis, Police Chief Sam Dotson said windows of businesses located across the street from a protest gathering spot were smashed and 21 people were arrested on felony accusations, including illicit gun possession. But no one was shot. "What we saw last night is the criminals were using the cover of the organized protests to do their criminal activity," Dotson said. News about the grand jury's decision not to indict Wilson also spread quickly nationwide, spurring others to turn out for spontaneous rallies in support of Brown's family and against what they characterized as unnecessary force by some police against citizens, especially African-Americans. Some laid down on the street outside the White House in protest. In New York's Union Square, scores held up a huge, lit-up sign that read, "Black lives matter." More protesters took their message to the streets of Seattle, Washington, and Oakland, California. Others will get their chance to express their views in more than 100 pro-Brown family vigils and gatherings in cities big and small -- from Los Angeles to Bangor, Maine -- planned nationwide on Tuesday. There is the chance that, in Ferguson or any of those places, violence could flare between protesters and police. The idea of more destruction and more violence pains the Rev. Traci Blackmon, a pastor at Ferguson's Christ the King United Church of Christ, who backs Brown's family but not what's happening to their city. "I hurt for all the people in my community, and I hurt for the many young people who did everything they could ... to make sure that last night was not violent and make sure their voices were heard," she said. "And unfortunately, the pain and the rage of a few have made a different narrative." All of this unrest, all of this tension dates to August 9, when Brown and a friend were walking down the middle of a Ferguson street. What happened next -- from the shooting, to the failure to immediately charge Wilson in Brown's death, to the at-times violent clashes between authorities and Brown family supporters -- turned Ferguson from a largely unknown St. Louis suburb to the center of a national debate over race, law enforcement and the interaction of the two. The basic facts have never been disputed, that Wilson shot Brown. But exactly how and why that happened is hotly disputed. Grand jury testimony released late Monday offered little resolution, with Wilson's version contradicting the accounts offered by some witnesses. The St. Louis County grand jury of nine white and three black members got a lot of information -- meeting 25 times, during which they heard from 60 witnesses and three medical examiners in 70 hours of testimony. The grand jurors' mission was never to convict Wilson. Rather, it was to decide whether there was reason enough to charge him with a crime -- either first-degree murder, second-degree murder, voluntary manslaughter and involuntary manslaughter. They also could have added a charge of armed criminal action. If at least nine of the 12 grand jurors had voted that there was enough to proceed with charges, Wilson would have stood trial.